And just like that, another year is coming to an end. Thanks so much to everyone who has supported me in some way this year - that may have been with work, with ideas or just with conversation. Auckland Philharmonia, New Zealand Symphony, Auckland Symphony, Christchurch Symphony, Auckland Youth Orchestra, St Matthew's Chamber Orchestra, Manukau Concert Band, Victoria Kelly, Neil Finn, NZTrio and Horomona Horo, Tecwyn Evans, Michael Norris, Leonie Holmes, John Rowles, Ben Hoadley, Val Landi and Scott Hunt (USA), Bluebird Avenue, Fatcat & Fishface, Alexandros Pappas (Greece), Sideways Productions, Elizabeth Mandeno and David Kelly, the Polkadots, the KBB Music Festival and The Big Sing. Next year is going to be a big year and absolutely business as usual so get in touch to get me involved with your projects - either as a music preparer, typesetter or editor, or as an arranger and orchestrator. Over Christmas and New Year I'll be fishing and eating too much near here, chill-axing and probably still eating too much here, and then tramping and working off the Christmas food here. I'll be back working full-time on Monday 6th January, but feel free to get in touch over the break. Enjoy, and have an absolutely wonderful Christmas! Final notes go in for Victoria Kelly's "Toi Huarewa / Suspended Way"
This week I have had the absolute pleasure of typesetting Victoria Kelly's new piece Toi Huarewa / Suspended Way - a 20-minute collaboration with Horomona Horo, Tim Worrall and NZTrio. There are so many great things about my job, but getting to see how different composers work and seeing their ideas come together on paper is just wonderful. It was also very inspiring seeing the collaborative nature of this work too, right from the early workshops (as can be viewed here in a short documentary by Jonathan King) up until the final post-rehearsal tweaks and revisions. This morning, without a moment to spare, the final version got the tick of approval and it's good to. It looks stunning on paper and the snippet of rehearsal I heard was amazing so I think we're in for a treat tonight. 7pm in the Auckland Town Hall Concert Chamber. 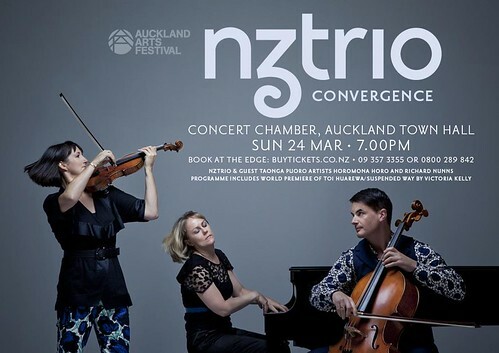 The concert is part of the Auckland Festival and also features works by Gareth Farr, Gao Ping and Chen Yi.